Ascending Butterfly: Win A 'Serene Spring Spa Gift Tower' from 1800Baskets.com! 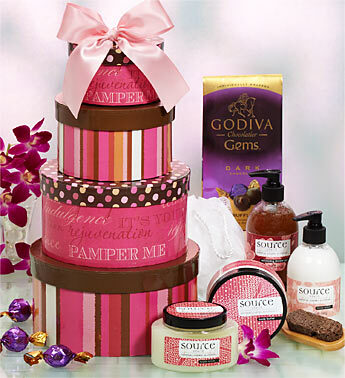 Win A 'Serene Spring Spa Gift Tower' from 1800Baskets.com! This giveaway is now CLOSED. Thanks so much to our wonderful sponsor 1-800baskets.com! We look forward to working with you again! The winner is Carolsue! Remember: There are great giveaways active on the upper right hand side of the page! This was gift #4 in our first annual Mother’s Day Buying Guide! We are now launching our fourth gift in our first annual Mothers Day Buying Guide! We started with the gift of CleanRest (giveaway ends on 04/28), followed by the gift of cream perfume (giveaway ends on 05/01), the gift of One Dozen Long Stemmed Roses and Godiva Truffles HERE (giveaway ends on 05/03), and now we are moving on to a gift that will allow you to pamper mom, the 'Serene Spring Spa Gift Tower' from 1800Baskets.com! Is your mom the one that will give the shirt off her back to anyone? The one that makes sure you and the family always have everything they need but forgets to treat herself? Today's Mothers Day Buying Guide Pick takes care of HER. Would you have to drag your mom kicking and screaming to step foot in a spa and be pampered? Well then, bring the spa to her, she'll love you all the more for it! My absolute favorite way to relax is with a long hot bath. I like to draw a bath and I love scented products, turning 'tub time' into at home 'spa time' gives me much needed time to get centered and simply does boost my spirits! The 'Serene Spring Spa Gift Tower' from 1800Baskets.com is pure delight for the senses, from the ultra cute packaging (that can be re-purposed once you've finished with all the products to hold keepsakes and stationery too! it can also be placed on your dresser to hold jewelry (and yes, that's a HINT ladies of things to come!) to the amazing contents including spa and bath products and a super indulgent package of Godiva Chocolate 'Gems' (These truffles are definitely 'gems' for your mouth!). I absolutely love this tower of treats, and the only negative I can find is that eventually I will run out, thankfully this hasn't happened yet! Want to know what's in the basket? Don't you just ♥ 1800Baskets.com? I know I do! Ƹ̵̡Ӝ̵̨̄Ʒ - How to Win: (1) You must be a PUBLIC follower of Ascending Butterfly to be eligible for this and all giveaways. Indicate in your entry that you follow (if your 'comment name/user id' differs from your profile id, please let me know what name you follow under) and (2) Visit 1800Baskets.com Mother's Day Gifts - and post the URL of another basket you like aside from the giveaway basket of course, as your comment entry! Please post the LINK, not the name! (3) You must also leave your email address somewhere in your comment. (You can format it this way for security, example: ascendingbutterfly AT mail host DOT com, If it is visible in your profile, just say so, that's OK!). Please follow the easy 1, 2, 3 steps to winning! This giveaway is open to USA residents who are 18 years of age or older. (Leave a comment with the tweet’s url so you can get a valid entry - click on the time your tweet was sent to get the direct URL and then copy and paste it here). Please tweet once per day. Follow 1800 Baskets on Twitter. Fan on FB Networked Blogs. I also like the: http://ww12.1800baskets.com/product.do?baseCode=93164&dataset=11226&cm_cid=d11226. I voted for your mom on ICE.com's contest - she really is beautiful! I voted for your outfit in the Macy's fashion director contest. Good luck! i voted for you in the 2010 Bloggers Choice Award - good luck! I like the Mother's Day Luxury Spa tote too! but all of the baskets are lovely.. I like their springtime favorites basket. I follow. Thanks for the chance. I would love the http://ww12.1800baskets.com/product.do?baseCode=93392&dataset=11226&cm_cid=d11226 (Coffee Basket). and i lvoe this basket!! big coffee fan! I follow publicly. I like this basket. I'm following 1800baskets on Facebook (Kathy Luman) and I wrote on the wall that Ascending Butterfly sent me. I entered your Win the Gift of CleanRest® - 2 pillows, 2 pillow encasements and 1 mattress encasement! Giveaway. and I told them you sent me. I follow and I love the godiva chocolate basket! I like the Apres Rain Spa Basket. I voted for you on Networked blogs - thanks for the chance to win, great giveaway! I fueled yr blog by voting on the "Fuel Burner" button, rt side of your blog-posting! I'm a current e-mail subscriber - great blog! I am following 1-800 Baskets via Twitter as jlsc123. I am a fan of 1-800 Baskets via Facebook and have written on their wall about this contest. I'm a follower! I loved the Spring Bounty Gift Basket! It's very... well... bounteous! If this is double posted sorry, but my computer locked up.